Bampton is a very traditional, pretty market town with a thriving main street, which dates back at least to 700AD. The town’s centre has been declared a conservation area and has many listed buildings, some as early as the 17th century. The two is steeped in history. Our pub was originally lodgings to accommodate the masons and other craftsmen who were hired in 1450 to enlarge the 12th century St Michael’s church, which is just behind us. We have recently renovated the pub to a high standard and it now has a solid oak bar, giving it a contemporary, yet welcoming feel. The original fireplace and bread oven dating back to 1450 have been retained too. The Heritage & Visitor Centre in the church here in Bampton includes lots of information about the town’s extensive history, so is well worth a visit. The townsfolk have greenfingers and have won the Britain in Bloom national award numerous times and even scooped a world win in 1999. The town’s Spring Festival takes place in May each year and includes an annual teddy bear parachuting races from the church tower. It’s great fun for all the family and a good time to come and visit if you have little ones. Meanwhile, Bampton Fair, held on the last Thursday in October every year, existed long before King Henry III granted it a charter in 1258 and is one of the oldest in the country. 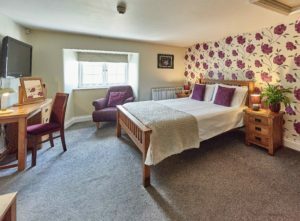 Why not treat yourself to a night away? Click here to book one of our spacious and comfortable rooms. To sign up to receive our latest news and events, please click here.